As the 2017 Grand Prix season draws to a close, F1 cognoscenti remember the glory days of Alfred Neubauer, who was team manager (Rennleiter) of Mercedes racing from 1926 - 1955. He created the famous 'Silver Arrows',which once again have scooped the world championship and enabled Lewis Hamilton to dominate the season and become world champion for the 4th time. 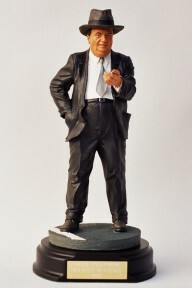 This rare, limited edition figurine of Alfred Neubauer is a must have for serious collectors. No collection of Mercedes racing cars is complete without Alfred's formidable presence.